10 Memorable Things Madeleine Albright Said at AU | American University Washington D.C.
Madeleine Albright at AU. Credit: Photo Collective Photographer Anna Moneymaker. She's a practitioner in the art of diplomacy, but make no mistake: Madeleine Albright doesn't mince words. That characteristic candor delighted a packed house at American University's Bender Arena on October 17. Part of All-American Weekend, the event was sponsored by the Kennedy Political Union, a student-run lecture series on campus. The talk was moderated by School of International Service Diplomat in Residence Sally Shelton-Colby. Albright discussed her time as a staffer to Sen. Edmund Muskie, D-Maine and as an aide in the Carter White House. During the Clinton years in the 1990s, she was U.S. ambassador to the United Nations before making history as the nation's first female secretary of state. "Madeleine Albright knows a thing or two about breaking glass ceilings," noted KPU Director Valeria Ojeda at the event. And the trailblazer had plenty of insights to share with the AU community. Here are 10 memorable things Albright said on Saturday night. 1. Referencing a recent Washington Post article, she commended American University: "It's becoming much more selective, which is good news for all of you and bad news for my grandchildren," she joked. "While much is changing on this campus, some important things really do remain the same. That includes AU's strong commitment to fostering new leaders and public servants, and the deep connections that have formed between this school and the broader community of Washington, D.C."
2. Albright encouraged AU students to set high expectations: "I'm not suggesting that you run around school knocking people down. But I am suggesting that you set goals in life that are more ambitious than job security, financial security, or the kind of security among your peers that comes from following the crowd. To run from risk is to run from life." 3. She conducted a special interview during her college years: "I'll never forget my chance as a reporter for the college paper to interview a young senator who was running for re-election. His name was John F. Kennedy. Actually, I don't remember much about what he said, but I do know I asked him for an autograph. This, according to other journalists, was completely unprofessional. But who cares? I have the autograph." 4. In response to a question about the 2014 Russian annexation of Crimea, she referenced JFK's historic speech at AU in 1963: "I did re-read President Kennedy's speech that he gave, and I read it this afternoon. And there are paragraphs in there that sound as though they could be said today, which are that the Russians were making up facts and saying that they had control over certain parts of the world." 5. About breaking those glass ceilings: "You're in a meeting, you think you're going to say something, and then you think, 'I won't say it because it sounds stupid.' And then some man says it, and everybody thinks it's brilliant, and you are really mad at yourself," she recalled. "So the good thing would be, first of all, if women learned to interrupt, and just decide to talk in meetings." 6. On getting her voice heard amongst a divided national security team in the White House: "You have to be prepared, always, to resign if you don't like something. What I think is actually more important—because you can only resign once—is to figure out whether you're operating in a system where the president actually wants to hear your opinion." 7. In disagreeing with other Clinton Administration officials, she advocated for military action to remove Slobodan Milosevic's forces from Kosovo: "What happens is the secretary of state can say whatever, but has no airplanes. So the bottom line is you have to try to get the rest of the system to agree with you. And, ultimately, we were able to work that through. President Clinton agreed with me." 8. She was also asked about continuing instability in the Balkans: "We are Americans, and what we like to do is have a box and check it as 'done.' 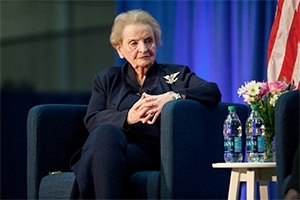 Things are not 'done,' they have to be managed," Albright said. "We need to continue to be involved, and I think Dayton [Accords] probably needs some adjusting." 9. She gave quite an emphatic presidential endorsement to Hillary Clinton, and she said Hillary recommended her for the secretary of state position: "I don't think there's ever been anybody running for president that is more prepared on foreign policy—or [as] experienced just generally—than she is." 10. Albright commented on being an immigrant from Czechoslovakia: "I came to this country when I was 11 years old. And even though I'm very proud of my Czech background, people ask me, 'What is the most important thing that ever happened to me?' Becoming an American, hands down."